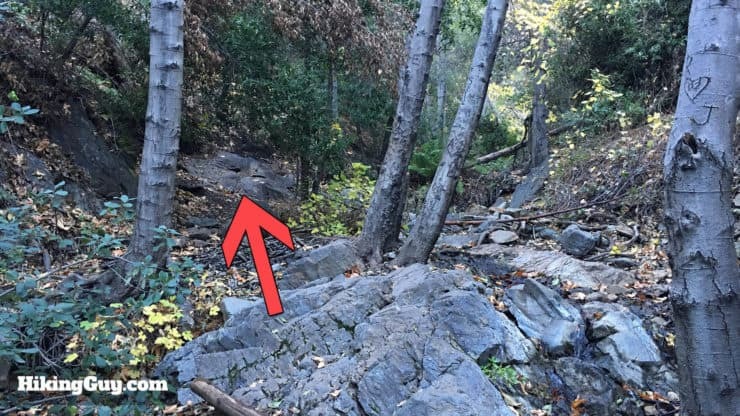 Why is this area called Holy Jim Falls? Well, in the 1870s this area was popular with beekeepers, and there was one called James T. Smith, who evidently was a bit of an unsavory character. 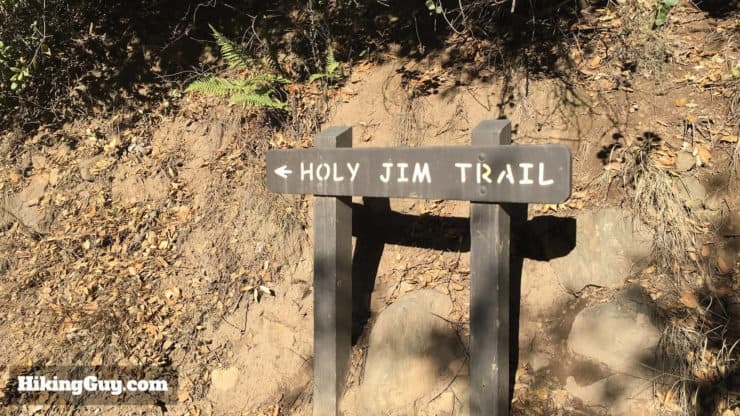 He earned the nicknames of “Cussin’ Jim”, “Lying Jim” and “Greasy Jim.” To irritate him, his neighbors started calling him “Salvation Jim” or “Holy Jim.” When government surveyors came through and asked who owned the land, Jim’s clever friends said “Holy Jim,” forever etching this joke into geographical history. Holy Jim Canyon used to be full of grizzly bears. Local hunters, ranchers, and beekeepers actively hunted the grizzly to extinction. 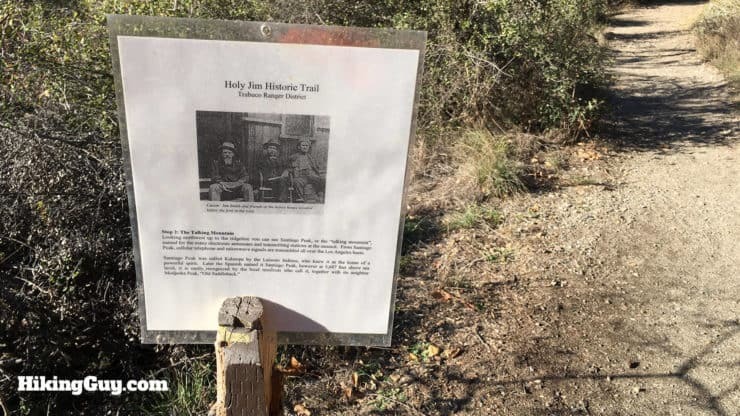 There’s also some sad history at Holy Jim Canyon. It was here on January 5, 1908, that the last confirmed grizzly bear kill in California occurred. The California Grizzly adorns the state flag today, but they are extinct (in CA). It wasn’t always that way. 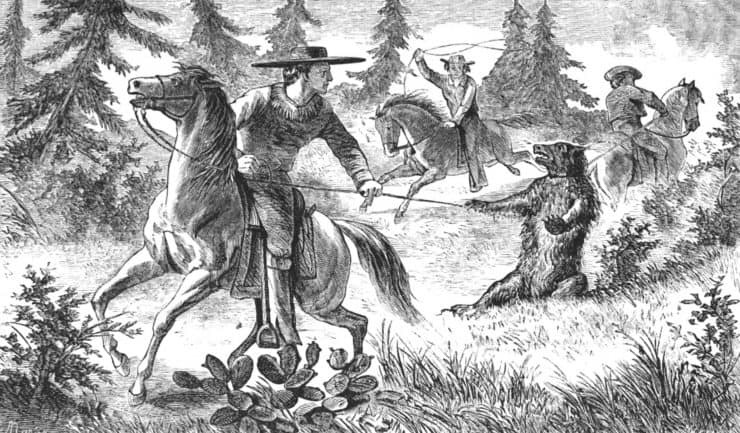 Grizzlies used to roam all of the lower areas of Cleveland National Forest up to the 1860s.The government put a bounty of $10 a head on the grizzly, and by the 1870s, they were mostly gone. 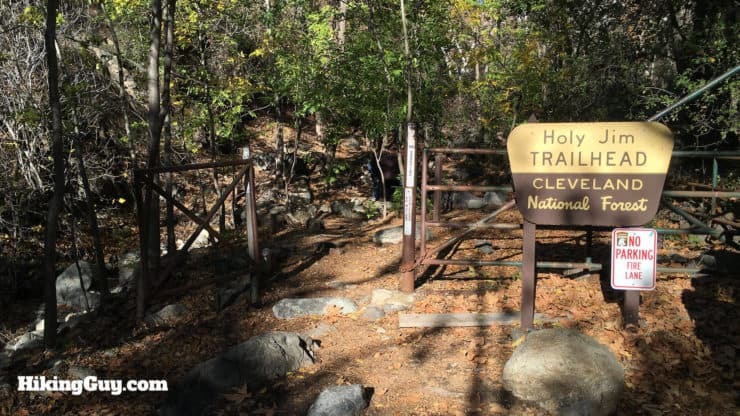 The hike to Holy Jim Falls is a nice, easy hike. 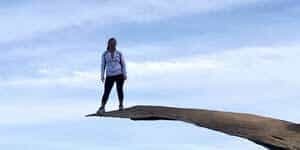 If you want to hike to the top of Saddleback Mountain, it’s a serious effort and best left to hikers with experience and fitness. 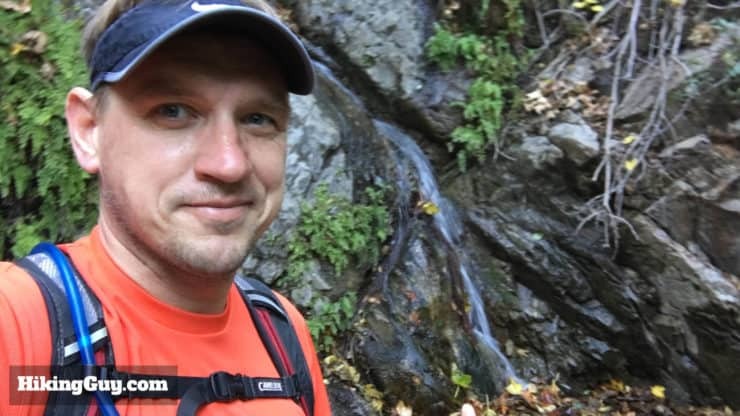 Here’s what’s involved with the hike to Saddleback Mountain. 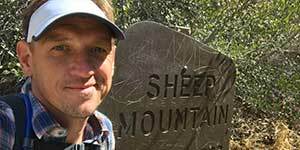 These two hikes share the trail for a while, so you’ll see signs for Saddleback / Santiago peak as well. The last 5 or so miles are on a dirt road that’s best done with a higher-clearance vehicle, but I’ve seen cars do it before. Just take it slow and beware of potholes. I’ve seen really low cars do this, it’s doable. 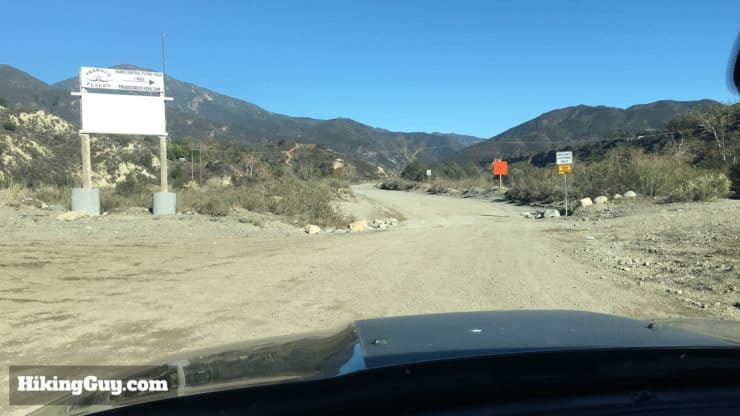 The drive to the trailhead address brings you on Trabuco Canyon Road, which is dirt. 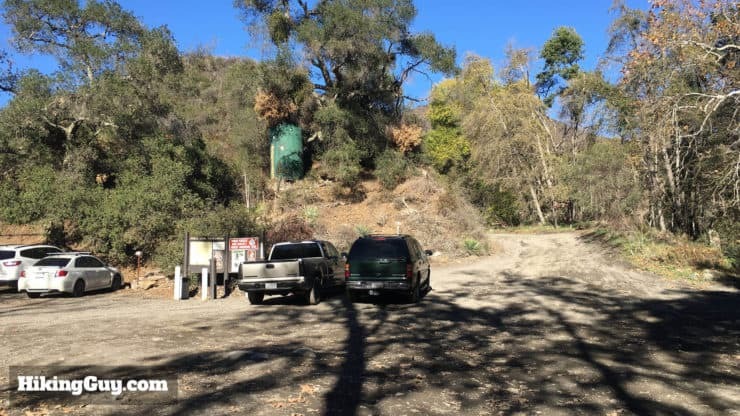 This is the start of Trabuco Canyon Road, coming from the paved road. 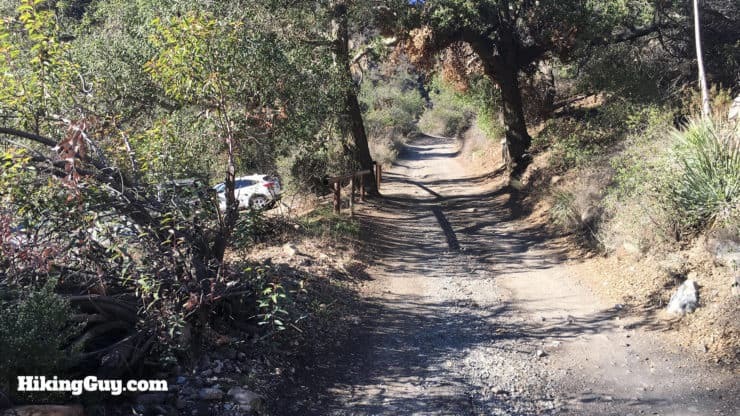 The beginning of Trabuco Canyon is gravel, and it gets more rutted the farther in you go. You need a parking pass for the Cleveland National Forest. 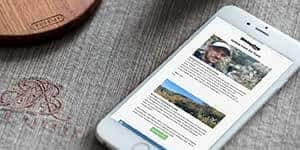 I use the affordable National Parks Pass, which gets me in every national park, national monument, and national forest. 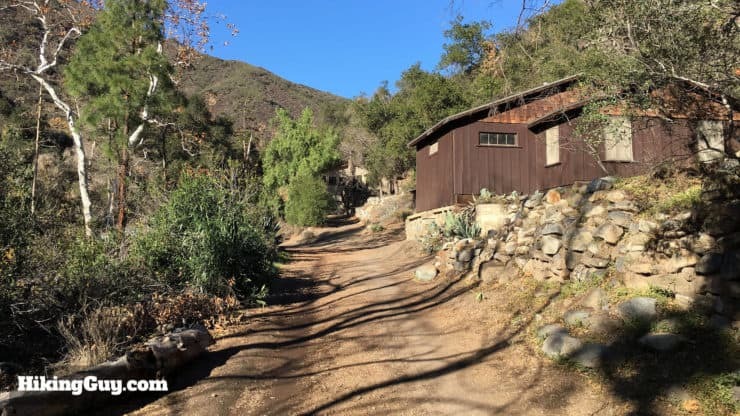 You can also use an (Southern California only) Adventure Pass, or buy a $5 day permit from the Trabuco General Store. 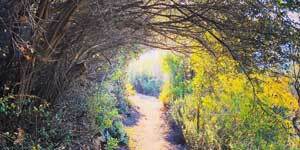 This is a pretty easy hike that you can do in fitness clothes. 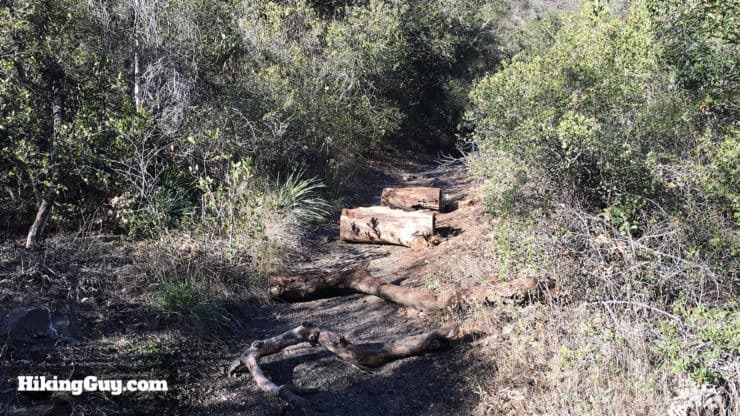 There can be poison oak along the last section of the hike, so you should either be careful or wear long pants. 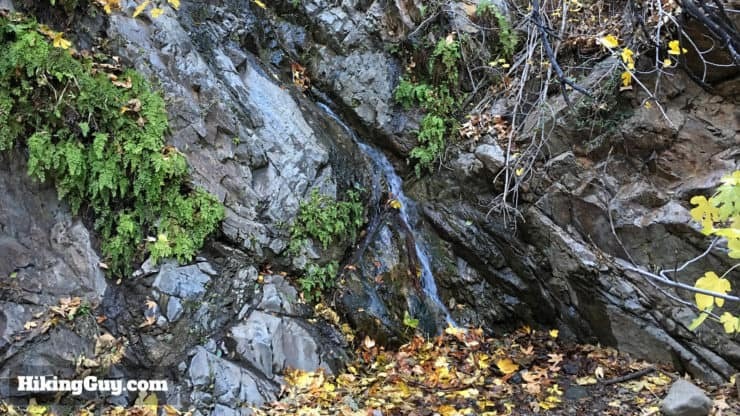 The hike to Holy Jim Falls follows the valley floor, making an easy hike. Park in any of the spots in the lot. The parking area has basic ports-potties. 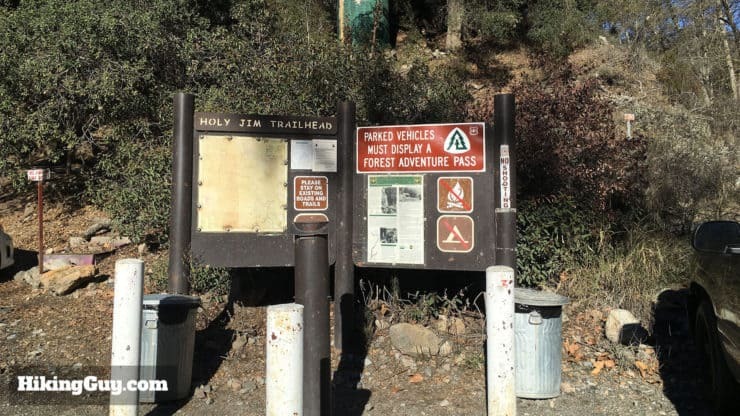 Read the Holy Jim Trail sign in the parking lot for any notices. If you’re looking at the sign in the last picture, you go behind it on the dirt road to the left. There are signs to help you get started, including this metal one. 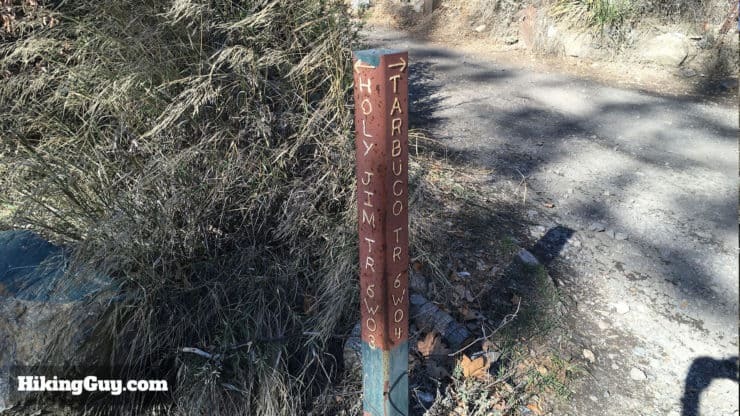 The start of the dirt road also has this big sign for the Holy Jim Trail. The beginning of the hike goes along a dirt road. After a few minutes on the road, you’ll go through a section of private cabins. Respect the private property and keep going straight on the dirt road. 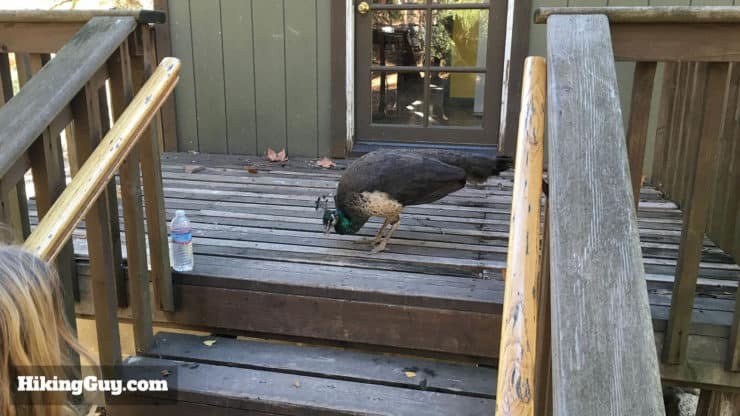 Some of the folks have free-roaming peacocks as pets. Keep your eyes open, they’re a hit with the kids. As you hike through the cabins, the direction to the trail proper is marked by signs. 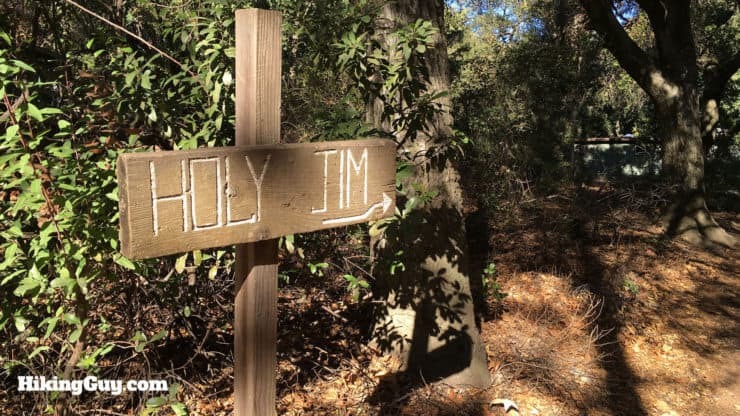 At about 0.6 miles, you reach the official Holy Jim Trail trailhead. Go straight through. The trail is well defined and crosses some streams. If it’s been raining heavily, you might have to rock hop across the stream. 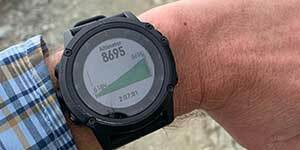 The trail climbs gradually, and is well defined. 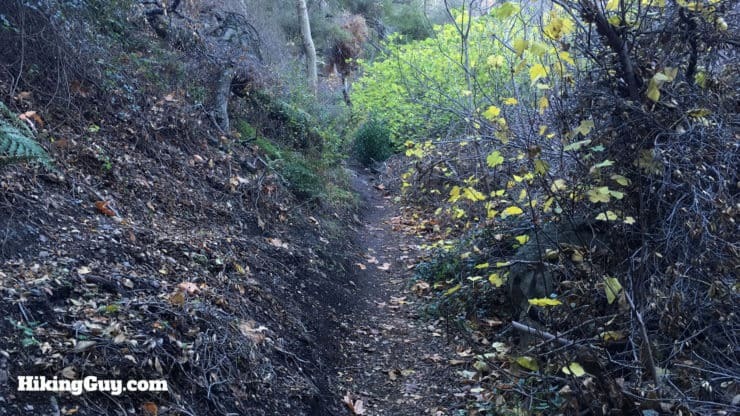 You might see some side trails to the right leading down to the creek. Stay on the main trail. The most photogenic spot occurs on this part of the hike. 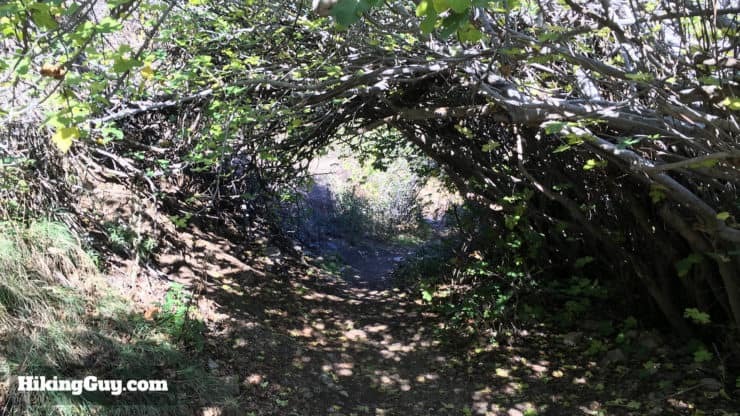 The trail goes through a circle of alders and oak. 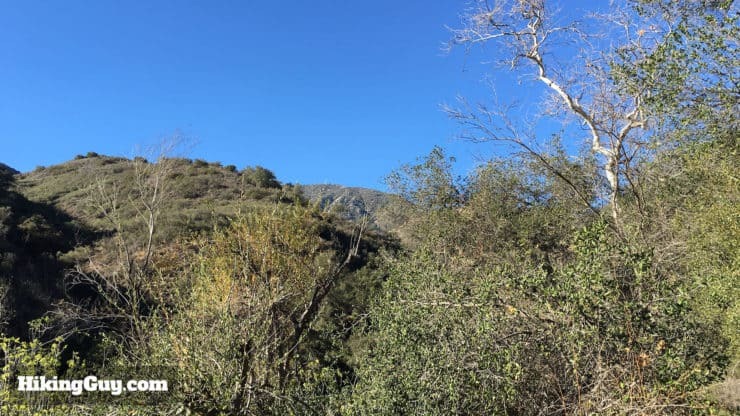 Look up to the left as you hike for a glimpse of the peak of Saddleback Mountain. You might come across some historical markers on the trail too, keep your eyes open. Eventually the trail drops down to the creek and then climbs back up. Right after that last trail drop, the trail splits. Head right to Holy Jim Falls. 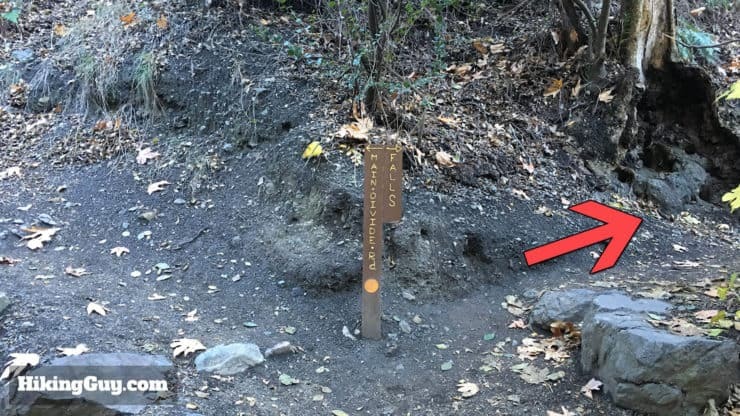 This part of the trail is much less developed, but still well marked. 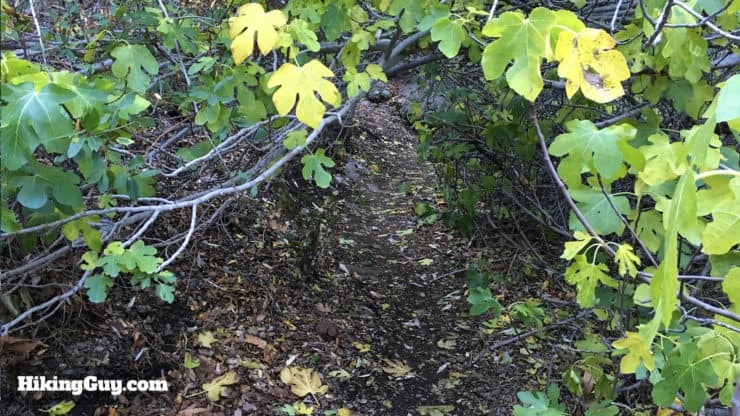 There are sections of the trail that are overgrown. Just move the branches and keep going. 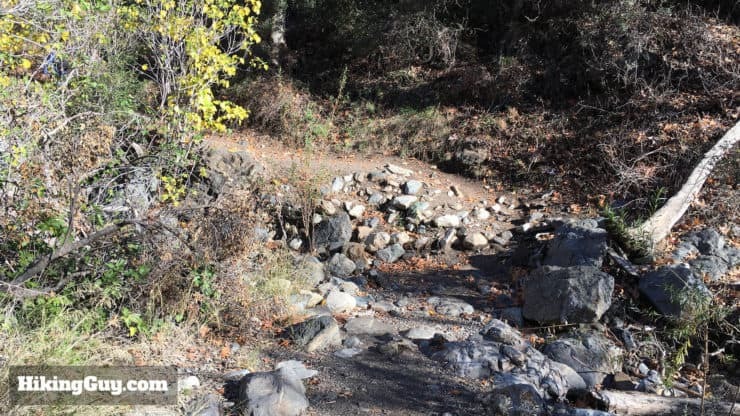 Eventually the trail will come out to and follow the rocky stream bed. It’s not well marked here. 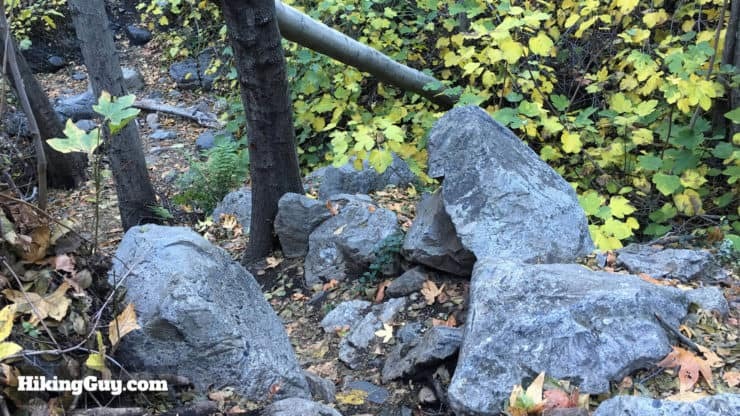 In general, stay to the left and keep your eyes open for the trail along the rocks. You made it! If there hasn’t been a heavy rain, the falls can be on the light side or even dry. 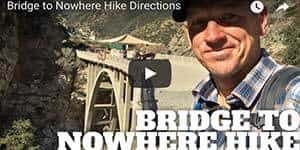 If the trail dead ends at a cliff and you don’t see any water, the Holy Jim Creek is dry. Grab your selfies and head back the way you came. Happy hiking!